What is your go-to hairstyle when you’re in a rush? Do you leave your hair as it is or throw it up, depending on the length of your hair or time available? Not having an extra few minutes to give our hair a bit of attention can really affect our confidence throughout the day and, of course, the health of our locks if we neglect it. So, in this post, I thought I’d share some convenient hairstyles for work and busy days that are quick, easy and stay looking great until bedtime. 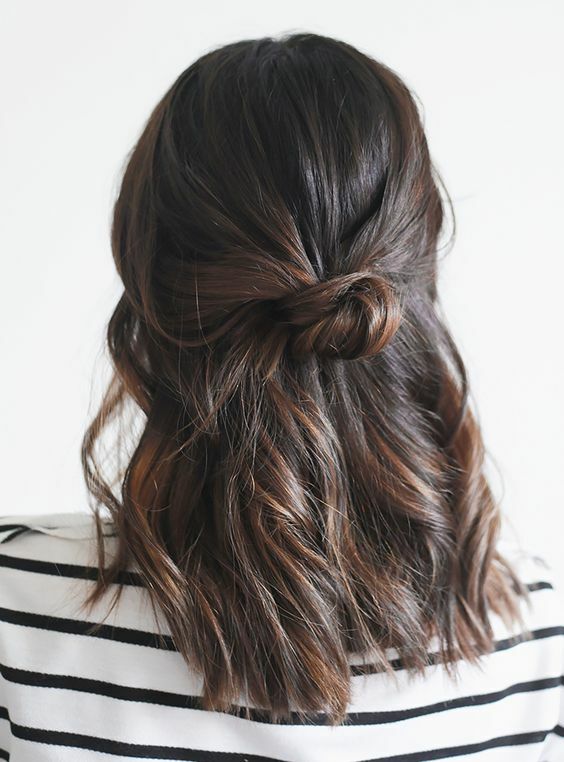 Simple, but gorgeous, hair styling in limited time is definitely possible. Here are 6 easy hairstyle ideas which look great, keep your hair healthy and, most importantly, take minimal time to achieve. Most of the time, I prefer to wear my hair down. But, I find my hair looks a little boring if I leave it natural when I don’t have time to properly style it with waves or curls. By simply adding a high bouffant at the crown of the head, it instantly creates a more glamorous, put-together look. Quickly teasing the hair underneath, smoothing over the top, setting it with hairspray and securing it with some bobby pins makes the world of difference to a pretty plain hairstyle. A half-up half-down hairstyle is really quick to do if you’re running late, as you only have to worry about styling half of your hair rather than the whole lot. Keeping the bottom half of your hair down, you can do whatever you fancy with top section, whether that’s pulling it into a ponytail, bun or braid. This is the perfect style to wear a statement hair accessory with, such as a pretty hair clip. Okay, so a plait or braid may seem a little more time-consuming than most styles, but once you get the hang of them, they are a so quick to do and can look seriously impressive. To make a standard plait a little fancier, you can simply tweak it into a French braid by starting at the hairline and pulling sections of hair into the braid as you go. To save even more time and get a few more minutes of sleep, you could even plan and ahead and braid your hair in the evening, before simply neatening it up in the morning to get rid of any wispy bits. Now, for my personal favourite. When there’s a serious time crunch and your hair is a bit out of control, a messy bun is an ideal option. A messy bun is super fast to do and keeps your hair manageable all day long. If you love the look of a messy bun but your hair is quite fine, like mine, I recommend back-combing it a little to get more volume. I also love adding some texturizing spray to the hair to give it a bit more grit and grip. The best thing about it, it doesn’t need to look totally smooth and perfect and the less time you take to whack it up, the better the finish! Changing your hair parting can greatly impact your look and will transform your usual look in no time. If you’ve got a center parting already, try switching it up into a side sweep with a deep side parting. If the hair doesn’t want to stay in place, which it probably won’t do, you can spritz it with hairspray and try to hide some bobby pins around the front and back to prevent it from falling back into your old parting. Whichever side you choose for the parting, you’re still free to do whatever you like at the back of the hair. 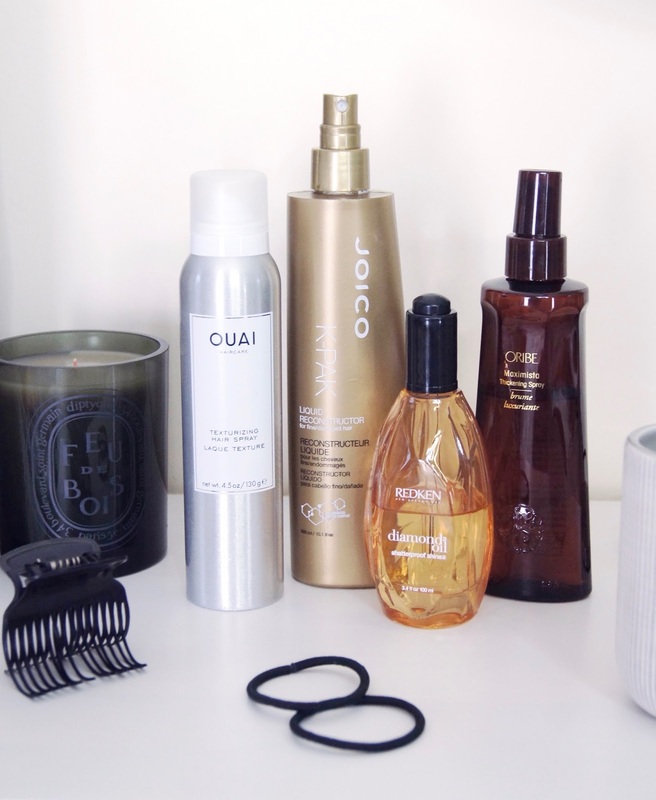 To get your hair looking amazing in a short space of time, it’s important to use the right hair products and styling goodies. You can browse a lot of innovative hair care and styling products at www.leluna.co.uk. How do you style your hair when in a rush? * This post is in collaboration with Le Luna. The messy hair bun is my spirit animal - always running late! !